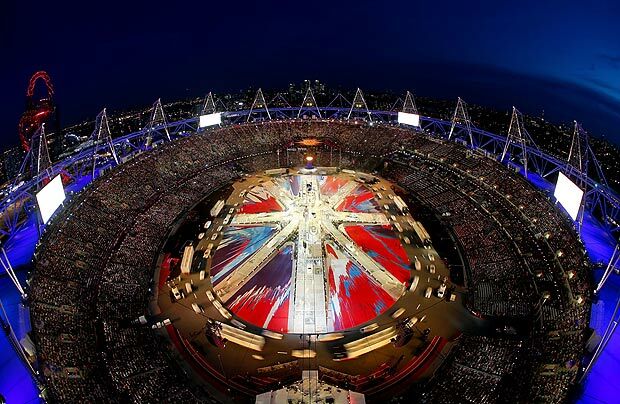 What was the last song played at the 2012 London Olympics? If you bet My Generation, you win. Considered rock’s first rebellious anthem, My Generation took the house down as the London Olympics came to an end. Considered rock’s first rebellious anthem, My Generation took the house down as the London Olympics came to an end. It was a night full of surprises. Madness performed their 80’s classic Our House and the Pet Shop Boys played West End Girls. Ray Davies, of The Kinks, strummed Waterloo Sunset – a classic London song. We got to hear John Lennon singing Imagine while looking at a famous album cover of the missed Beatle. George Michael impressed even non-fans with his stage presence. The Kaiser Chiefs pre-empted The Who’s set with Pinball Wizard, from the rock opera Tommy. Annie Lennox always knew how to put on a show and she did it last night with Little Bird. We were most surprised to see Nick Mason join in on the drums for a Pink Floyd song, Wish You Were Here. The David Bowie medley was fun to watch. Eric Idle kicked off the last part of the closing ceremony with a rousing Always Look on the Bright Side of Life. This scene was just as funny as Mr. Bean in the opening ceremony! Brian May (of Queen) belted out blistering solos and then, the moment many of us were waiting for – The Who! The Who played Baba O’Riley (“Teenage Wasteland”), See Me, Feel Me and Listening To You (the Tommy finale) and finally the ultimate rebel song, My Generation. The fireworks really kicked off during The Who’s set, especially as the riffs of My Generation flew into the air. What an amazing ending! We had a great time and hope you did too. Our sports coverage is only heating up! Visit our Sports Section and stay with Online Casino Archives as we cover your best bets in sports.